The mobile device revolution has come and gone with smartphones and tablets beating out more traditional computing systems for the mindshare of the general population. With mobile app development and mobility technologies on the rise, businesses have been left to contend with a diverse range of operating systems and device formats, creating development complexity that can quickly derail projects. A study published by the IEEE pointed out that the need to support mobile users in enterprise settings has led to a growing movement toward in-house app development. The need to create apps quickly and get them into production in a similar hurry is pushing organizations to implement cross-platform mobile app development solutions. The move toward cross-platform development is happening at a breakneck pace. A study reported on by IT Pro Portal found that cross-platform app development tool use has increased by 10 percent year-over-year in the past 12 months. What’s more, businesses are ramping up their in-house development efforts as they work to keep up with mobile users. In last year’s version of this study, just 51 percent of those polled were creating apps in house. This year, that figure rose to 71 percent. With cross-platform development gaining headway, businesses must carefully consider how the functionality will meet their specific needs. With that in mind, let’s look at the two major pros that come with the development methodology and counter that conversation with two of the cons it presents. When developing an app for native use on a specific ecosystem, the development team will use a specific software development kit associated with that OS, and possibly for a device. Once that app is created, organizations must manually port the app over to another OS by identifying all of the code that can work commonly on the other system and then customize everything else to make the app work. This need to do the same work multiple times extends to testing—multiple versions of the app must be tested in multiple hardware configurations—and to production, where operations teams need to roll out multiple instances of the app. Cross-platform development eliminates all of this redundancy by allowing teams to develop, test and release one version of the app and have it work across all operating system environments. Major APIs and similar development tools are becoming a primary component of many app development strategies. In fact, plenty of organizations are using APIs to effectively integrate diverse services within app platforms, creating a significant degree of simplicity that can streamline and accelerate development projects. 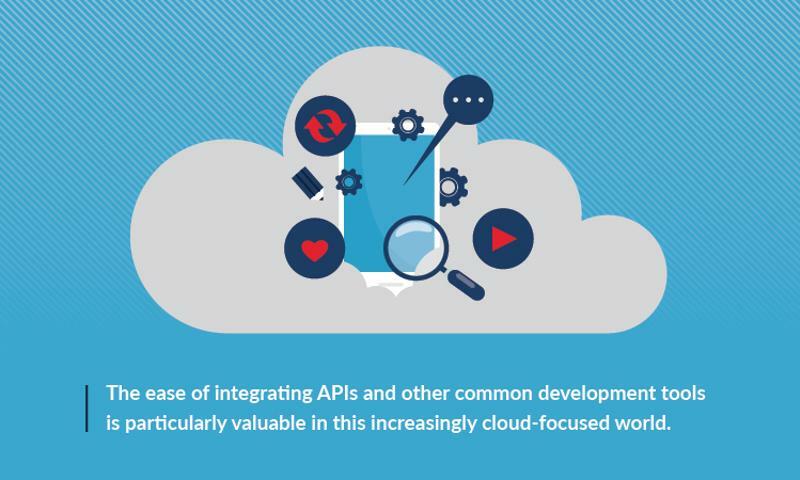 The ease of integrating APIs and other common development tools is particularly valuable in this increasingly cloud-focused world. With businesses frequently rolling out custom apps and housing them in the cloud, the simplicity of the service model can be undermined by coding complexity. Modern APIs and development tools change this dynamic by adding a layer of simplicity to cross-platform development that is a natural fit with cloud environments, particularly app platforms. The problem with platform-neutral code is that most apps will run at their best when the code used is written for the specific operating system they are hosted on. The issue here is fairly straightforward – as each OS handles different background tasks in unique ways, the programming necessary to establish app functionality will need to vary based on those core capabilities. Apps written in more neutral methods may not be optimized as well relative to those unique capabilities. For example, a development team writing an app for Android may be able to use the open source nature of that operating system to write some unique bits of code that customize data workflows and maximize the hardware resources available to maximize performance. Those benefits would disappear when porting the app over to iOS. Writing an app with cross-platform tools creates a situation in which none of those small, platform-specific benefits come into play. Emerging development methodologies are democratizing app creation. As we just mentioned, every operating system and device can provide some unique functionality that isn’t available elsewhere. The ability to customize apps and services around these specific feature sets can lead to powerful apps. For example, the toolset within one operating system may be designed to allow a certain graphics quality baseline that enables developers to create robust GUI that engage users. This same framework may not be in place elsewhere, limiting a company’s ability to customize apps based on the unique capabilities of a platform. While users may want similar functionality across desktop, laptop, smartphone and tablet interfaces, they also want experiences that are optimized for each device format. Cross-platform development allows for customization and performance baselines that let apps work well on each device type, simplifying deployment. However, it also makes it difficult to get ambitious and refine apps based on the specific capabilities of devices and operating systems. Low-code app development solutions are adding a new wrinkle to the cross-platform development movement. Low-code platforms that enable users to mix and match pre-built packets of code let teams to create apps with the speed and ease of a cross-platform system because the raw code is already in place, but these modular app packets are often designed to work natively on different platforms. Application development platforms that offer this type of native low-code functionality let users quickly create apps by getting major capabilities settled natively, but quickly, and then using cross-platform development capabilities as needed for other code segments, optimizing the ratio between speed to market and app performance.